The Fowlerville Community Schools, a K-12 institution, has all the regular security needs of an educational institution. They need to restrict Internet usage to prevent students from viewing inappropriate material and downloading unnecessary files like music and movies. However, their content filtering system was outdated and required a lot of active management. 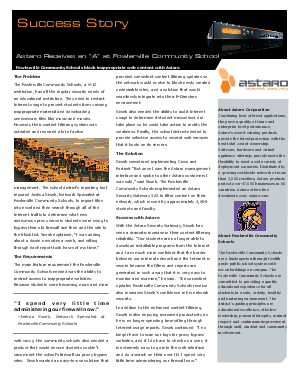 Register for this free case study and read why Astaro Security Gateway 525 was selected over Cisco and Fortinet to filter content on their network, which is used by approximately 3,500 students and faculty.